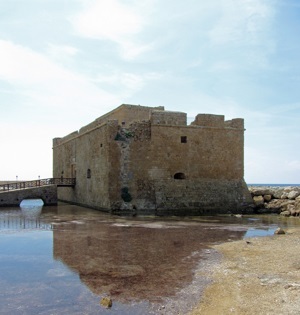 Located in the Paphos Harbour area, Paphos Castle is one of the most distinctive and well-recognized landmarks in Paphos. It has been a listed building since 1935. The first castle on the site was built during the Byzantine period to protect the harbour. However, this castle was destroyed by an earthquake in 1222. A second castle on the site was built by the Lusignans (Frankish crusaders) who controlled Cyprus at that time. In 1570, the Lusignan castle was dismantled by the Venetians. However, when the Ottomans occupied Cyprus, they rebuilt and strengthed the castle. The castle has served many purposes during its life: fortress, prison, and even as a warehouse for salt during the period of the British occupation of Cyprus. Today, Paphos Castle is open to the public on most days, during the daytime, and you can have a look around inside. Additionally, the castle is used a backdrop during the annual open-air cultural festival in Paphos, which takes place in September each year.